While this mapping style worked well with rF1 it does not with rF2. Something must have changed during development of rF2 and as soon as you'll have a bump tex stage in your shader those normal issues will appear on the mirror-mapped parts of the car. First we thought that we would have to redo the mapping and therefore the templates and of course all of the liveries that were already done. That would have been a real timekiller, but Andy came up with an idea: what if we use our old mapping and create a new mapping channel with a fixed mapping just for the normal map only? As our normal map is almost completely empty due to modelled body lines it was worth a try and just a tiny setback compared to redoing all liveries. So we created a second map channel with the fixed mapping and told the bump tex tage to use our channel 2 instead of 1. All other tex stages are still using channel 1. And it worked. The normal issues are gone and we're able to continue our work. 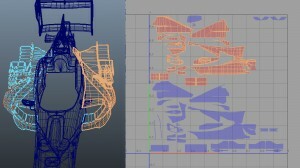 While our mapping method is different from other game producers or modders, using mirror mapped parts is a very common "tool" in game industry. If you know where to look, you can even recognize these normal issues on ISI stock content in rF2. The sad part is that a 2006 convertion isn't possible anymore as we would have to redo the mapping of each car including all LODs plus creating new normal maps for those mappings. That is just way too time consuming. 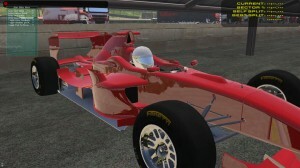 So until ISI doesn't fix this shader issue there's no chance for a 2006 revival for rF2.When we started modeling the cars for F1 2006 back in early 2006, we didn't even think about modeled bodylines or holes. 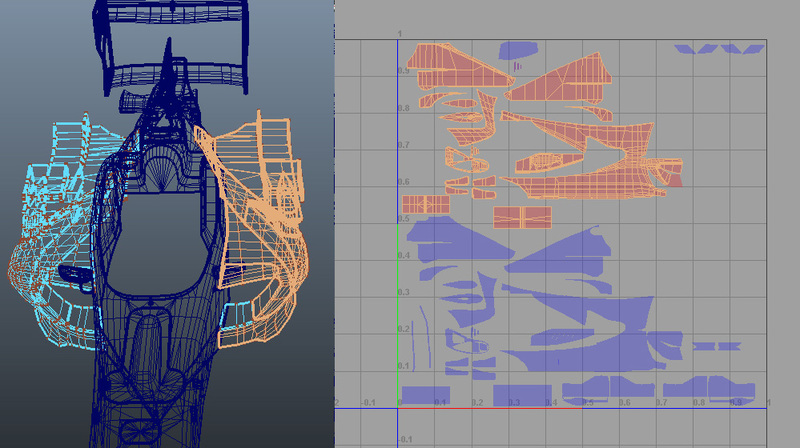 These parts are all on our normal maps what makes a CTDP 2006 normal map much more complex compared to IFM and 1994. Also if you're doing your mapping CTDP style remember to create a clean mapping channel for your bump tex stage to avoid these problems. Even if you're doing your livery mapping without mirrored parts you may still encounter this problem on other parts of the car. Two parts (with one on the left and the other on the right side of the car) share the same texture mapping and most likely one of them has a mirrored mapping. As soon as you're using a shader with a bump tex stage those normal issues will occur, too. So either use a shader without bump tex stage - if thats possible - or fix your mapping for the bump tex stage. We still hope ISI will fix that bug sooner or later (hopefully before they're going gold), but for now we have to live with this situation and have to make the best out of it. Update 10 April 2012: Added another illustration of our mapping. Well, it looks like IFM definitely serves its purpose: to find out in what rF2 differs from rF1.